1. AdBrite: It is top paying alternative to Adsense. Just it publishes "your ad here banner" in you site and in this way it finds someone to sell their ads. So Adbrite will publish those ads on your site and the cost will be set bu you and in case you don't like some ads then you can block it. 2. Bidvertiser: Well this is the best option for the bloggers and site owners who have minimum traffic, Bidvertiser have many formats of ads and it can resemble with your site's designs. But I recommend you the Pop ups because they are the high paying ads. You can also earn more from the Bidvertiser through bonus and the minimum payout is $10. through Paypal. 3. Clicksor: This pays you the 85% of the revenue and their ads are based on the contents of your site. You need to supply them the specific keywords of your site which matches your site's content and you get the ads resembling your site. 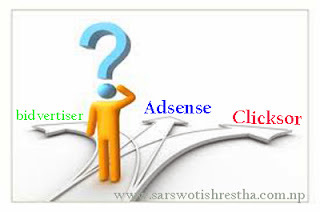 You can also get many sites under single account but they must get approved. The minimum payout is $20 in the Paypal and $50 in the check. The ads formats are Pop ups, Interstitial ads and Dynamic Highlighting. 4. Infolinks: This is the best paying text-advertising network and I really liked its system as it finds some advertising keywords from your blog that are not linked and makes it a advertising link and when the visitors puts his cursor near to those words a pop up will appear and when he clicks on it, you get bucks. You can use Infolinks with other networks too. 5. Smowtion: This is better paying CPM ad network useful for the site having great traffic. They have nice images, animation, banners pop under as their ad formats and their recent ad format is slider which is the best method of earning and you can earn extra bucks from this. Their minimum payout is $100.They pay 60% of the total revenue and the payment methods are ATM, check or Paypal account.